Ever sit in your stylists chair and have no idea how to describe what you want? You and your stylist are trying to come to a solution and you feel like a deer in headlights? I've had clients show me pictures of golden highlights when they're saying the want ashy tones, and request a balayage when showing me pictures of a double process platinum blonde. Don't feel bad because it actually happens all the time, and it's not your job to know how to request the right technique. Check out this video on how I transformed my clients hair to a bright blonde, with no damage! One thing to keep in mind about all the photos below is that every hair color looks different even though sometimes the exact same tones, formulas and techniques are used. Everyones hair is different, reacts differently and has had a different hair history, yeileding different results for each person. If you like blondes that have icy, gray, ashy, or pearl tones to them, that means you prefer a cool toned blonde. If your skin tone has more pink, blue or red undertones cooler blondes will look best on you! When asking for a "cool" toned blonde, tell your stylist that you like your color to be more on the ashier side. This type of color usually takes a few visits to achieve even if starting out blonde, because you have to eliminate all warmth from the hair. To achieve cooler toned results I do heavy highlights, bring the hair to a level 10 blonde with no remaining pigment or warmth. After the highlights are rinsed I tend to use a toner such a level 10 ash. This type of color is usually somewhat damaging to the hair because you are taking your natural color as light as possible. All of the posts below are "ash blonde"
To achieve this pearl blonde color: ask for heavy highlights, and a toner with natural ash base. Slightly more ashy than the 1st color, for this type of result: ask for highlights with a ash toner. Even ashier than both photos above. This client has level 7 ash lowlights with heavy highlights. To acheive this tone: ask your stylist to over compensate and make your color as ashy as possible, almost on the grey side. First, I want to say that warm blondes do not have to mean brassy. 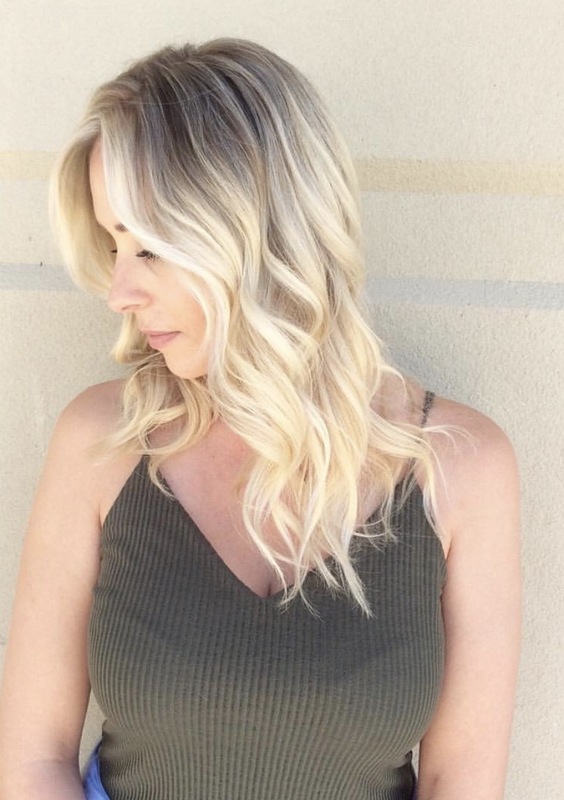 I feel like so many clients are afraid of asking for a warmer toned blonde because of bad experiences or fear of having the unwanted yellow, orange hair color. Golden toned blondes can be very beautiful and also appear brighter, and shinier than ashy blondes. If you are drawn to buttery, honey, golden or bronze tones, you like warm blondes! This color works well with gold, peach or yellow skin tones. If you're nervous about having a warmer toned blonde, ask your stylist to ease into it. Start with a more neutral color, having neither ash or warm based tones, this is right in the middle. Then I would add just a dab of gold mixed in. You can add more of the gold each time. One tip is to use purple shampoo once a week or every other week with warmer blondes to prevent the color from looking too brassy! A perfect example of a creamy buttery blonde. This color is right in the middle of warm and cool, yet still not super golden. For this color: I did highlights, bringing them to a level 10 but not white. Then glazed her with a level 10 natural blonde. I added a little ash to prevent the color from looking too brassy long term. This beautiful lady has a slightly more golden tone than the previous color. We do highlights with lowlights of a level 8 brown gold. And I glaze her with a level 10 gold toner! This clients hair is definitely a lot more golden! She almost has a strawberry tint to it. We do a ton of lowlights to create different tones, of a level 7 gold, with a few highlights. I then glaze her with a level 10 "brown" gold! Neutral blondes are right in the middle of cool and warm. I like to think of neutral with beige, creamy, or wheat tones. This is the perfect way get a balance of cooler and warm tones! You could also try adding lowlights of a neutral color if you're currently platinum or light blonde. That way you get a mixture of tones, which is a great way to ease into a new shade of color! This client has a neutral tone, with highlights and lowlights! She has a variation of tones with pops of brighter blonde, and lowlights of a level 7. Her overall glaze was a level 10 ash to prevent unwanted warmth from her previous color. This is a great example of a light neutral blonde! This color has beige tones, and was created with highlights and then glazed all over with a level 9 neutral blonde! Honestly, double process blondes are not my favorite. This involves lightening the hair all over...on the scalp with bleach, no foils. This type of color is as blonde as blonde can be. Bleach is applied directly to the scalp which I believe is damaging, and gives the illusion of one color, leaving none of your natural color. This usually has a harsh line of demarcation when it grows out and rarely looks natural. Personally, I don't believe this is the best type of blonde to request because of damage. IF this is your desired color, make sure your hair is in the most healthy condition and be prepared for breakage with time.. especially around the hairline. Plan on being in the salon every 4 weeks, spending at least $150+ Make sure your stylist is not overlapping bleach. I would recommend to use cotton between each section to keep the color from overlapping. Double process platinum blonde works well with fair skin and light features. However, sometimes other skin tones can pull this off. Think Kim Kardashian when she went platinum blonde. I personally do not perform this service, because of the risk of damage. To request a healthier version of this look: ask your stylist to do very very heavy highlights trying to eliminate most of your natural color in between foils and then glaze with an ash based toner. This will most likely take a few visits. This color was done with heavy highlights, little dimension left, and an violet based ash glaze. 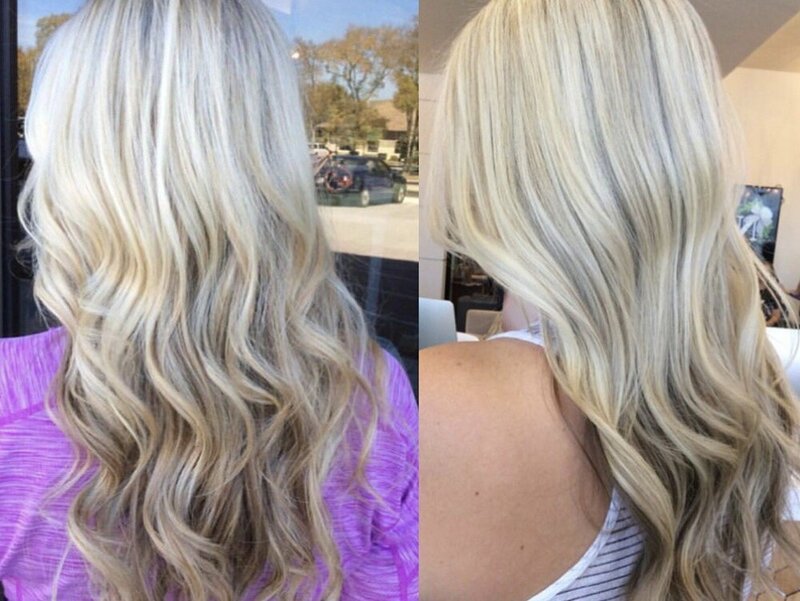 A base break or high lift blonde is similar to a double process blonde however rather than using bleach, hair color is used to "break" up the natural color left between highlights. A base break is more gentle on the hair than a double process done with bleach, but still doesn't provide a natural outgrowth. This process involves highlighting the hair, processing, rinsing out the highlights, towel drying the hair and then applying hair color at the root for a few minutes to further lighten the hairs that didn't get highlighted in a foil. Sometimes this exposes unwanted warmth, because hair color can not lighten the hair as much as using bleach can. This again, is not my favorite process because harsh outgrowth, however I do have a few clients that request this service! You might like a base break/highlift color if you're a fan of a double process blonde, or don't like to see ANY of your natural color after getting highlights. This color would be good for you only if your natural color is a level 7 or lighter. I personally would not do a base break on anyone darker than that wanting to be blonde to avoid exposing unwanted warmth in the hair. Take a look at her root, she does not have any of her natural color, you can see that every piece of hair was lightened. Her natural color is a level 8 and we lighten her with a level 12 ash violet highlift blonde. She gets highlights every 3rd appointment. A beautiful example of a highlift color that is still looks natural and healthy! This client is also a natural level 8, we just do highlights all over, and you can see the different variations in tones at the root. No highlift color or base break. Babylights are a newer trend that I'm a big fan of! A good way to imagine babylights is to think of a young girls hair. Mostly their natural color, with those perfectly placed natural looking highlights around the face, and brighter towards the ends. This is a good technique for you if you like your natural color, and just want a few sun-kissed highlights or baby fine highlights all over. Babylights are done by weaving very fine ribbons of highlights all over, and placing brighter pieces around the hairline and ends of the hair like the hair has been kissed by the sun. I normally do a root shadow (which we will talk about later) and leave out brighter pieces around the face and ends. This allows for a very natural looking color with a low maintenance outgrowth. Before and After of babylights! You can see the fine ribbons of highlights, and still quite a bit of the natural color while still keeping the light blonde ends. And another example of babylights. The before photo is a 7 month outgrowth of babylights, and the after was just done with very fine highlights placed all over! A darker example of babylights, but a good example lighteness around the face and ends while keeping your natural color at the base. You could even add a few more ribbons of highlights toward the root for a blonder effect. Dimension is always one thing I think clients have a hard time describing. They know their hair is lacking something, but don't know what it is. This is good for someone wanting to see more variations in color. Dimension is good for you if you like to see contrast, or different colors of blonde in your hair. Or if you don't like your hair to be one solid color. I recommend keeping the shades within 3-4 levels of each other to keep it looking natural. SO many clients are afraid of asking for lowlights because they've had bad experiences with chunky stripes, or the lowlights turn brassy with time. Lowlights do not mean that you're going to have the Kelly Clarkson early 2000 hair color. My little secret for lowlights are always always using an ash lowlight (unless requested otherwise) and never pulling the lowlight all the way through to the ends. To get the looks below ask your stylist for a multi-dimensional blonde, with 1-2 colors for a lowlight, and low lighting every third or fourth foil. These are different variations of blonde and all done with highlights and lowlights! A full highlight involves starting the highlights at the nape of the neck all the way around the the front of your head. A partial is starting at the crown of your head to the front. Full vs Partial highlights have nothing to do with how blonde your hair is, rather how consistent your color is from underneath to the top. If you feel like the underneath of your hair is dull, or dark you probably need a full highlight. A partial can be done every other or every 3rd time once the color is to your liking. Below are examples of clients who prefer partial highlights: you can see how the color is more dimensional underneath. The client below had been paying for a "FULL" highlight with her old stylist, clearly still very dark underneath. The right is after a full highlight with me. A root shadow is another trending service right now and one of my favorites! This technique can be as light or as dark as you want and involves highlighting the hair all over, and then tapping down or shadowing the root with a darker color to soften the highlights at the root. Pieces of blonde are ALWAYS left out around the face and hairline to keep those pops of brightness around the face! All of the clients below have different shades, and levels of root shadows! Some are more dramatic than others. To transition to a technique like this ask your stylist to start conservatively adding darker shades each time. I usually start this transition by adding lowlights just brought down about 4 inches from the root, and then doing a root shadow at the shampoo bowl. If your one of those blondies that just loves the look of a traditional highlight. Just ask for that! No root shadows, no base breaks, just a good old fashion highlight to the root, finished with a glaze, and toned to your preference. Heres what to look for when getting those highlights perfect-o. A toner or glaze is used to create every look we've talked about. It's used for creating cool, warm or neutral tones. Used when doing a root shadow, and also helps prevent the hair from getting brassy in between appointments. Think of a toner/glaze as a top coat for your hair. It adds softness and shine, while sealing the cuticle.